Most everyone familiar with the tragedy of Dyatlov Pass believes that whatever mysterious and strange event occurred, not all of the details have been shared by the Russian government. Tonight, we speak with Keith McCloskey, author of two books about the subject, "Mountain of the Dead: The Dyatlov Pass Incident" and "Journey to Dyatlov Pass: An Explanation of the Mystery" who has also traveled to the site for his research. We'll hear about his hypotheses and the current state of his efforts to petition the Russian courts to reexamine the case and declassify any previously unreleased information. We first spoke with Keith for our coverage on the Flannan Isles Lighthouse mystery and trust that he will bring the same diligent investigation and keen observations into solving this unfortunate riddle once and for all. At the Dyatlov Party’s group tomb at the Mikhajlov Cemetery in Yekaterinburg, Russia. At Dyatlov Pass. Dead Mountain in the background. A mysterious photo that was the last shot taken on a film roll from one of the hikers, which appears to show a bright, out-of-focus light, possibly in the sky. 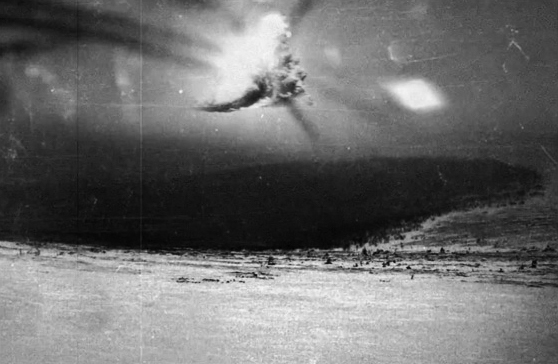 A photo that is often associated with the Dyatlov event but which researchers believe was not taken by anyone from the party. It appears to show an aerial explosion which might be connected to a military exercise taking place in the region, possibly around the same time. Another photo that is often associated with the event but is not believed to be from the film shot by the Dyatlov party. The mysterious fireball might be connected to a military exercise taking place in the region, as locals reported seeing large bright orbs in the sky during the days around the incident. Condition of the tent as it was found by rescuers on February 26, 1959. It had been cut open from the inside to escape quickly. The plane crash photo over Mt Fuji Keith refers to in his interview. “Dyatlov Pass” on the slopes of Kholat Syakhl in the northern Ural Mountains of the Russian Federation. There’s a fascinating new documentary just released about the US Government’s research into the technique of Remote Viewing, called Third Eye Spies. Produced by Lance Mungia with noted ESP researcher, physicist Russell Targ, Third Eye Spies examines the secrets behind the classified military program designed to explore the possibility that agents could be trained to consistently “see” and describe locations and objects hidden by foreign and domestic agencies from remote locations. Check out the details and watch a Trailer at ThirdEyeSpies.com. The film is available on DVD at the website, on iTunes and Amazon and also across digital streaming services worldwide including Cable services’ Video On Demand. We’re also excited to announce that the documentary features our friend Lori Williams and her Controlled Remote Viewing practice, which you can sign up to learn at intuitivespecialists.com. Lori was a part of our series on Flight 19 and has been interviewed on Coast to Coast AM numerous times. Hear yourself on the show! Here’s your chance to have your own voice on our show and receive a very, very modest amount of Internet fame! They’re called Listener Segues, and we need more of them all the time. Through the wonders of our digital age, you can record your own voice delivering one and then it magically shows up in a future episode… because our Sound Editor Sarah places them there. All you have to do is go to: tinyurl.com/astonishingsegues for instructions on how to do it. So record one today and become immortalized in glorious technology! … until a massive geomagnetic storm like the Carrington Event hits the earth again, so please do it sooner than later. hims – 66% of men lose their hair by age 35 – it's not just old guys! The thing is, by the time you start to notice you're losing it, it may be too late and it's easier to keep the hair you have than replace the hair you've lost! But don't worry just yet, because now you have ForHims.com, a one-stop shop for hair loss, skin care, and sexual wellness for men. hims connects you with real doctors and medical grade solutions to treat hair loss and E.D. No more awkward waiting at the doctor's office or at the locked cabinet at the pharmacy. Answer a few quick questions online and a doctor will review and prescribe generic equivalents to name-brand medications which are delivered right to your door. They also have skin-care solutions and supplements so you can look and feel your best. And now you can get a trial month of hims for just $5 while supplies last, just by going to ForHims.com/legends! See website for full details. Episode 136: Dyatlov Update #1. Produced by Scott Philbrook & Forrest Burgess; Audio Editing by Sarah Vorhees Wendel; Sound Design by Ryan McCullough; Tess Pfeifle, Producer and Lead Researcher; Research Support from the astonishing League of Astonishing Researchers, a.k.a. The Astonishing Research Corps, or "A.R.C." for short. Copyright 2019 Astonishing Legends Productions, LLC. All Rights Reserved.